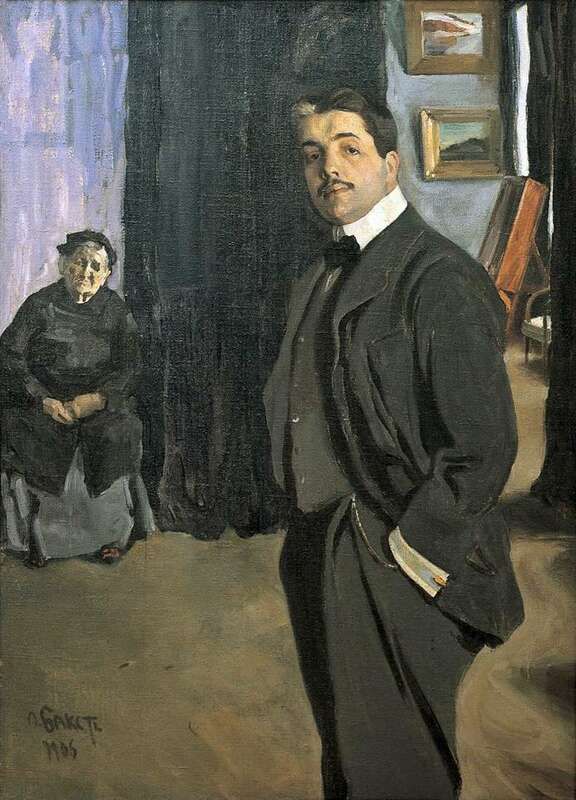 “Portrait of Sergei Pavlovich Diaghilev with a nanny” is recognized as the top of portrait creativity of Lev Bakst. It was completed in 1906, when the St. Petersburg period of Diaghilev’s activity came to an end, so bright, tense, full of ups and downs. Among the rich artistic iconography of this formidable “dictator from art”, there is not a single portrait in which he, all woven from extremely acute contradictions, would be so correctly understood. Bakst penetrated into the essence of his character, as if gathering together all the facets of his multidimensional nature, created the most complex image with unusually delicate pictorial techniques – the method of half-hints, half-notes. By depicting Sergei Pavlovich at the very edge of the canvas in “half-turn”, Bakst allows us to enjoy the contemplation of the elegant appearance of the portrait, and on the other hand – it opens the space of the distant plan and gives an opportunity to examine the interior of the St. Petersburg apartment. There, in the depths of the illuminated cabinet, you can see an easel and pictures on the wall, which immediately evokes a chain of associations: behind Diaghilev’s arms is the World of Art, the historical and artistic exhibition of Russian portraits in the Tauride Palace, and he, as if stepping onto the front of the stage, foreign theater triumphs await him. As though the dark blue, almost black curtain, on which the sensual, at first glance, arrogant face of the “secular dandy”, “arrogant viscount”, “charmer and charmer” seems to be particularly expressive, seemed to be drawn back by time-fate. But through the mask of monumentality and an indestructible fortress, one can see living human features: in the corners of hard-edged lips – not a smile, not a game of nerves of tenderness, but in the eyes – holy sadness, kindness and, as noted by Serge Lifar, an unexpected sentimentality. The intimate note of the image is strengthened by the presence in the portrait of an old-nanny Avdotya devoted to her pet. She connects the two distant banks of the rapid flow of Diaghilev’s life with a thin thread of memory: a happy childhood in Perm and a brilliant future in Paris. Between them – 15 years of Petersburg life. Description and meaning of the painting Diaghilev’s portrait with a nanny by Leon Bakst.